Animal Nature is an exhibition concept that has developed out of an ongoing, expanding web-project entitled Criminal Animal found at www.criminalanimal.org. Criminal Animal is intended to bring together a wide range of artists, critics, scholars and activists engaged in the broad field of animal studies. The site serves both as a clearinghouse for information and resources, as well as a means by which to bring together the far-flung communities of artists, scientists, philosophers, and cultural critics interested in investigating the nature of “the animal.” This site, having started just a few months ago, is already receiving much positive attention from those in the field. Animal Nature, and a series of related public installations/interventions in the city of Pittsburgh, will be an important subset of this work exploring the understanding of animals through a wide range of contemporary artistic and critical practices. The exhibition intends to be a select sampling of the work of artists, filmmakers, scientists, philosophers, and cultural critics who are currently pushing the boundaries of the complex issues in animal representation: the animal body, the trace of the animal, animal agency, animal presence, animal voice, and the cultural constructions that create our conceptual framework of “animal.” Animal Nature will be framed as a research project–not on animal bodies–but into our understanding of the animal through poetic, emphatic, semiotic, and formal strategies. Edwina Ashton is a London-based artist whose films, drawings, and installations have been exhibited widely. Her work has been seen recently in the United States in exhibitions at D’Amelio Terras, New York, at MoCA, Miami, and in Wisconsin. Recent European venues include Rotterdam, Bristol, Madrid, San Marino, and a one-person show at Peer, London. Her work has been featured and discussed in magazines and journals including Frieze, Cabinet, Performance Research, Tate, and Angelaki. The catalogue of the “Recognition” exhibition (Arnolfini, UK) includes a substantial interview with her, and her work is also discussed in Steve Baker’s The Postmodern Animal and in his contributions to the collections Representing Animals (edited by Nigel Rothfels) and Zoontologies (edited by Cary Wolfe). Steve Baker is Reader in Contemporary Visual Culture at the University of Central Lancashire, UK. He is the author of The Postmodern Animal (Reaktion Books) and Picturing the Beast (Illinois UP). He has lectured on his research on attitudes to animals in 20th and 21st-century art, philosophy and popular culture at the New Museum of Contemporary Art in New York, the Natural History Museum in London, and the Musée d’art contemporain de Montréal. He is a contributor to the web project www.criminalanimal.org, and a founding member of the Animal Studies Group, whose collection Killing Animalsis to be published by Illinois UP in 2006. He is currently working on a book entitled Art Before Ethics: Creativity and Animal Life. Catherine Chalmers holds a B.S. in Engineering from Stanford University and an M.F.A. in Painting from the Royal College of Art, London. She has exhibited around the world, at P.S. 1 (a MoMA affiliate), New York; Mass MOCA, North Adams; Corcoran Gallery of Art, Washington, DC; Yerba Buena Center for the Arts, San Francisco; Museum of Contemporary Photography, Chicago; Kunsthalle Basel; Kunsthalle Vienna; and MOCA Taipei, among others. Her work has appeared in a variety of publications, including the New York Times, ArtNews, Artforum, Flash Art, Blind Spot, the Sunday Telegraph, the Independent on Sunday, Harper’s, and Discover, and has been featured on PBS, CNN, NPR, and BBC. Chalmers lives and works in New York City. James Duesing is an animator whose work has been exhibited in venues as diverse as: The Sundance Film Festival; PBS; The Berlin Video Festival; MTV; Shanghai Animation Festival; Film Forum; and the Los Angeles Institute of Contemporary Art. He has received a fellowship from the American Film Institute and grants from the National Endowment for the Arts and Creative Capital. Public collections currently holding his work include: The Museum of Modern Art, New York; the Goethe Memorial Museum, Tokyo; the UCLA Film Archive, Los Angeles, and The Israel Museum. He has also been featured on Absolut Vodka’s web site about the history of animation, The Best of SIGGRAPH, and The Best of Prix Ars Electronica. He is a professor at Carnegie Mellon’s School of Art. Jessica Hodgins is a Professor in the Robotics Institute and Computer Science Department at Carnegie Mellon University. Prior to moving to Carnegie Mellon in 2000, she was an Associate Professor and Assistant Dean in the College of Computing at Georgia Institute of Technology. She received her Ph.D. in Computer Science from Carnegie Mellon University in 1989. Her research focuses on computer graphics, animation, and robotics. She has received a NSF Young Investigator Award, a Packard Fellowship, and a Sloan Fellowship. She was editor-in-chief of ACM Transactions on Graphics from 2000–2002 and SIGGRAPH Papers Chair in 2003. Her research interests include animation of human motion and humanoid robotics. Lane Hall + Lisa Moline are a collaborative pair of artists working with animal images and the representation of nature. Their work seeks to explore the boundaries between the natural and the technological. The act of collecting, visualizing and categorizing natural specimens is often the genesis of the work. Hall and Moline’s current research involves site-specific print and multimedia installations that are responsive to architectural and cultural settings. Recent projects include installations at the Milwaukee Art Museum, the Brooklyn Museum of Art, the California Academy of Sciences in San Francisco, Monique Meloche Gallery in Chicago, and Post Gallery in Los Angeles. Their interest in the representations of animals in contemporary art led them to create the Criminal Animal website, a repository for art and research focused on animals and the genesis for the Animal Nature exhibition. Lane Hall and Lisa Moline teach in the Department of Visual Art at the Peck School of the Arts, University of Wisconsin-Milwaukee. Andrew Johnson, (BFA, School of the Art Institute of Chicago, MFA, Carnegie Mellon) attended the Skowhegan School of Painting and Sculpture before joining the University at Buffalo art faculty for five years. He is currently Associate Professor of Art at Carnegie Mellon. Johnson’s exhibitions address exigencies of daily realities and undress the refined aesthetics of art. Recent solo installations that aspire toward a provocative political poetry include: Lavalas: The Flood; just another market mop up; StOck OptiOns; Democracy on Ice; Spring: Let Them Keep Their Children----Tethered; and Pressed: When Words Were Earth, at venues ranging from A Space in Toronto to University of North Carolina, Chapel Hill. His contributions to group exhibitions, here and abroad, also focus attention on the inequities of US domestic and foreign policy as in the forthcoming Disasters of War: from Goya to Golub at Wesleyan University’s Ezra and Cecile Zilkha Gallery in Connecticut. He is a co-founder (with Millie Chen and Paul Vanouse) of PED, a socially engaged collective that is simultaneously a pseudo service bureau and an info/excer-tainment outlet from which viewer/participants may embark on free, sitespecific, talking-bicycle lecture tours. Eduardo Kac is internationally recognized for his interactive net installations and his bio art. A pioneer of telecommunications art in the pre-Web 80s, Eduardo Kac emerged in the early 90s with his radical telepresence and biotelematic works. His work deals with issues that range from the mythopoetics of online experience, to the cultural impact of biotechnology; from the changing condition of memory in the digital age to distributed collective agency; from the problematic notion of the “exotic,” to the creation of life and evolution. Kac’s work has been exhibited at venues such as Exit Art and Ronald Feldman Fine Arts, New York; Maison Européenne de la Photographie, Paris, and Lieu Unique, Nantes, France; OK Contemporary Art Center, Linz, Austria; InterCommunication Center (ICC), Tokyo; Julia Friedman Gallery, Chicago; Seoul Museum of Art, Korea; and Museum of Modern Art, Rio de Janeiro. Kac’s work has been showcased in biennials such as Yokohama Triennial, Japan; Gwangju Biennale, Korea; and Bienal de Sao Paulo, Brazil. His work is part of the permanent collection of the Museum of Modern Art in New York and the Museum of Modern Art in Rio de Janeiro, among others. His work is documented on his website: www.ekac.org. Kac is represented by Julia Friedman Gallery, New York; Laura Marsiaj Arte Contemporânea, Rio de Janeiro; and Galerie J. Rabouan Moussion, Paris. Dorijan Kolundzija was born 1976 in Belgrade, Serbia. In 2000 he graduated from the Academy of Applied Arts in Belgrade, Department of Applied Graphics. In 2004 he received his MA in Photography and Graphic Design from the University of Wisconsin-Milwaukee. He currently teaches New Media at Megatrend University in Belgrade, School of Art And Design, and runs 12+design Studio in Belgrade. His latest work explores the possibilities of unconventional interaction with technology by responding to people’s positions and movements. Using the familiar instrument of their bodies, participants are enabled to engage in playful contact with projected animal-like creatures that do not really exist, blurring the boundary between real and digital, human and technological. Recent exhibitions include “Adelante” in Ljubljana, Slovenia; Progress” and “Feel free to touch the screen” in Belgrade, Serbia; and “Parainfluenza digitalle 3” at No Name Festival in Cacak, where he received the Grand Prix Award in International Design. Lyne Lapointe began collaborating in 1982 with critic and artist Martha Fleming, a practice that lasted until 1995, making it one of the most enduring Canadian artistic partnerships. From it emerged works such as Projet Building/Caserne #14 (Montréal, 1983); Le Musée des sciences (Montréal 1984); La Donna Delinquenta(Montréal 1987); Eat Me / Drink Me / Love Me (New York 1989); The Wild and the Deep (New York 1990); and Materia Prima (São Paulo 1994). Lapointe has since moved from collaborative work to delve into the individual practice that marked her beginnings. 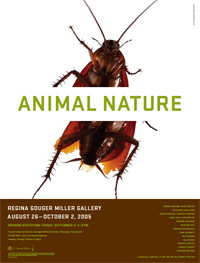 No Man’s Land was presented in Lyne Lapointe’s 2002 solo exhibition at the Musée d’art contemporain de Montréal, entitled “La Tache aveugle” [“The Blind Spot”], predominately depicting geometrical and animal images. Olly & Suzy have been making art together since they met as degree students at Central St. Martins School of Art in 1987. Olly&Suzi decided to leave the formal confines of their studios in 1993 and make their work on site in the wild. Since this time they have made over 30 expeditions to remote Arctic, desert, ocean, and jungle regions in search of predators and prey and the fragile habitats in which they live. Their interactive work is documented by award winning photographer Greg Williams, and on occasion by photographer George Duffield. 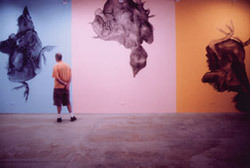 In 2001–02, Olly & Suzi staged a major year long retrospective of their work in the wild and subsequent art/science collaborations entitled Olly & Suzi Untamed at The Natural History Museum in London. A major book of their work entitled, Arctic, Desert, Ocean, Jungle is currently available from Harry N. Abrams in New York. In February 2005, they sailed across the Drake Passage to the Antarctic Peninsula and dived under the ice to make a documentary film about their work in the wild with Doug Allan. The trips will be documented in Esquire magazine throughout the year. Olly & Suzi are represented by Briggs Robinson Gallery in New York and Eric Franck Fine Art. Michael Pestel, an artist and musician, has performed, exhibited and lectured extensively throughout the United States, Europe and Japan. He has built large-scale zoetropic wooden structures (Sighting Wheel, Hadrian), site-specific pedestrian bridges (Piers Project, Ohio Gauntlet), large-scale structural cantilever systems (Sine Wave), and structures for music (Agronome, Spin-Out, Ornithology). His recent performance-installation (Harps and Angles), with tENTATIVELY a cONVENIENCE, combines prepared piano tables and 4-channel, live video footage. During the past decade, he has focused on bird sound and questions of extinction (Ornithology Series, SCHREIben, Migrations, Writing Lessons, Music Lessons, Aviary, and Birdscapewith Jeroen van Westen). He has performed on flute, contrabass clarinet, assorted woodwinds and violaire with birds in aviaries, natural places, Buddhist temples, galleries and concert halls. Currently, he is developing a multi-hybrid instrument on wheels called The Birdmachine and is working on a composition for flutes based on the red list of extinct birds. His CD Ornithology-Shadows is a musical conversation between two aviaries in Pittsburgh and Amsterdam. Steven Wilson is a San Francisco author, artist and professor who explores the cultural implications of new technologies. His interactive installations and performances have been shown internationally in galleries and SIGGRAPH, CHI, NCGA, Ars Electronica, BEAP, and V2 art shows. His computer mediated art works probe issues such as biological and environmental sensing; Information Visualization; artificial intelligence and robotics; hypermedia and the structure of information; GPS and the sense of place; and the role of artists in research. He won the Prize of Distinction in Ars Electronica’s international competitions for interactive art and several honorary mentions. He is Head of the Conceptual/Information Arts program at San Francisco State University. He was selected as artist in residence at Xerox PARC and NTT Research labs. He has published extensively. His latest book, Information Arts: Intersections of Art Science and Technology(published by MIT Press in November, 2002), surveys artists, theorists, and researchers working in advanced inquiries in fields such as biology, medicine, physics, artificial life, telepresence, body sensors, vr, artificial intelligence, and information systems.